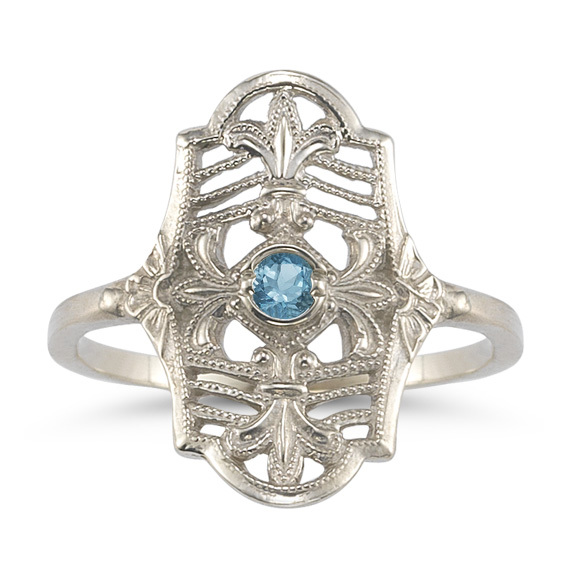 Our vintage fleur-de-lis blue topaz ring is reminiscent of Victorian-style engraved bands. Set in 14k white gold with a genuine 3mm blue topaz gemstone center stone. Head of ring measures 3/4" x 1/2" (18mm x 13mm). We guarantee our Vintage Fleur-de-Lis Blue Topaz Ring in 14K White Gold to be high quality, authentic jewelry, as described above.